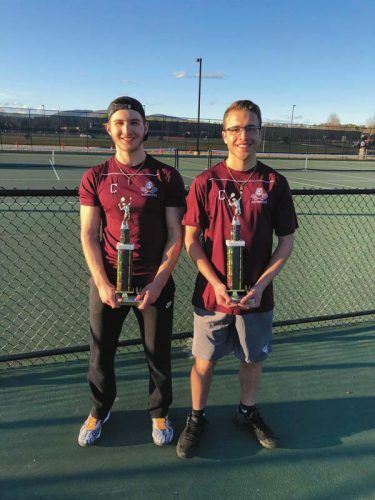 GLOVERSVILLE — Playing Burnt Hills-Ballston Lake on opening night is always a tough assignment, but playing an emotionally charged Spartans squad proved to be too much for the Gloversville Huskies. Two weeks ago, the Spartans’ Deacon Martucci was killed in an automobile accident. On Friday, the Burnt Hills players led their procession onto the field with his No. 12 jersey and put together a strong opening-night performance, defeating the host Huskies 64-7 in a Section II Class A Grasso Division game at Robert E. Gould Stadium at Husky Field. Burnt Hills held Gloversville to a three-and-out on its first possession and started their first scoring drive of the game on their own 37. The Spartans put together a six-play 63-yard drive that culminated with Vincent Daviero carrying the ball in from 16 yards out and Ghaith Shahin kicking the extra point for a 7-0 lead. The Burnt Hills defense kept the Huskies in check in the first quarter, allowing only one first down in the period on a 27-yard run by Nick Nellis. Meanwhile, the Spartans’ rushing game hit its stride, with D’Andre Lashley scoring on runs of 17 and 22 yards to stake Burnt Hills to a 21-0 first quarter advantage. Lashley picked up his third touchdown of the game, gathering in a 39-yard touchdown pass from Darien LaPietro. After Jared Slovic returned a interception for a touchdown and Bryce Mussen scored on a 44-yard touchdown run, the Huskies put their first points of the season on the board. Starting on their own 28, the Huskies put together a five-play, 72-yard drive highlighted by a 34-yard pass play from Anthony Tomek-Russell to Julien Deumaga and a 46-yard touchdown run by Petey Raldiris with 3:12 left in the opening half. The Huskies looked to put another score on the board before halftime, when Deumaga recovered a fumble on the Burnt Hills 38. The Huskies moved the ball to the 25 before attempting a reverse, fumbling the ball, which was recovered by Jakai Townsend and returned 69 yards for a touchdown to help stake the Spartans to a 50-7 halftime lead. 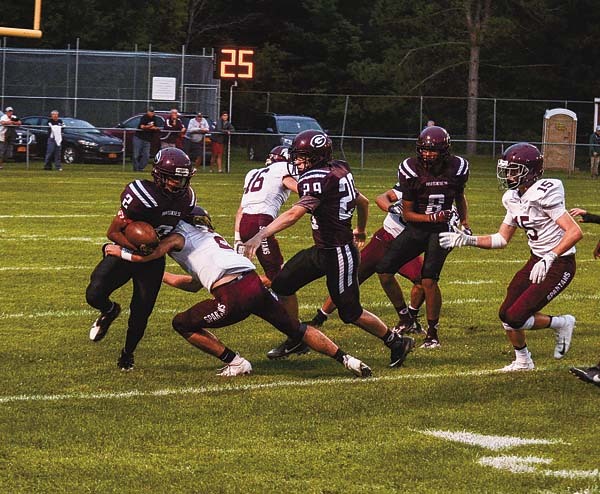 Burnt Hills opened the second half with another big play as Daviero took the hand off on the first play from scrimmage in the third quarter and raced 63 yards for a touchdown and a 57-7 lead. The Spartans added one more score when Samuel Gardy ran the ball in from 35 yards out in the fourth quarter to close out the 64-7 score. Burnt Hills finished with a 445-161 advantage in total yards for the game and held a 362-81 advantage in rushing yards. LaPietro was 4-for-6 passing for 83 yards and one touchdown, while Tomek-Russell competed 5 of 12 attempts for 80 yards and two interceptions. Daviero carried the ball nine times for 136 yards and two touchdowns, while Lashley ran the ball seven times for 63 yards and two touchdowns and caught one pass for 39 yards and a touchdown. For Gloversville, Raldiris carried the ball 13 times for 49 yards and a touchdown, while Same Getman rushed the ball six times for 11 yards. Prior to Friday’s game, the Huskies held a moment of silence for coach Jim Bongo who passed away during the offseason. 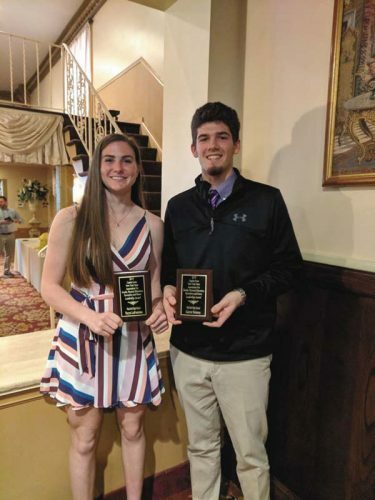 He served as an assistant coach for the Huskies with his son, head coach Jared Bongo, after serving as head coach at Wallkill, Warwick Valley and Troy High Schools. BHBL — Vincent Daviero, 16 run. (Ghaith Shahin kick), 8:12. BHBL — Lashley, 22 run. (Shahin kick), 2:38. BHBL — Lashley, 39 pass from Darien LaPietro. (Rece Gobel run), 10:04. BHBL — Jared Slovic 39 interception return (Shahin kick), 8:34. BHBL — Bryce Mussen, 44 run (Shahin kick), 6:08. G — Petey Raldiris, 46 run, (Anthony Tomek-Russell kick), 3:12. BHBL — Jakai Townsend 69 fumble return, (Shahin kick), :00. BHBL — Daviero 63 run (Shahin kick), 11:20. BHBL — Samuel Gardy, 35 run. (Shahin kick), 10:13. SCOTIA — Ivan Roberts rushed for 116 yards and two touchdowns to lead Broadalbin-Perth to a one-point victory over Scotia-Glenville. Broadalbin-Perth (1-0 overall) is scheduled to host Ravena-Coeymans-Selkirk in its home opener next Friday at Patriot Field at 7 p.m.
Scotia-Glenville is scheduled to host Burnt Hills-Ballston Lake next Friday at 7 p.m.
AMSTERDAM — Cameron Chrzanowski turned in touchdown runs of 14 and 78 to lead Amsterdam to victory over Lansingburgh Friday at the Lynch Literacy Academy. The Rams also got a touchdown run from Peyton Ausfeld, while Jose Merced and Trayvon Jones caught touchdown passes from Trey Ausfeld and Kyle Desbiens added a safety. CANAJOHARIE — Derek Hyney threw for two touchdowns and ran for a third to lead Canajoharie-Fort Plain to victory over Fort Edward/Argyle Friday at Canajoharie High School. Sam Terwilliger carried the ball 10 times for 105 yards and a touchdown, while Nick Mazzarella carried the ball one for a 62-yard touchdown. Defensively, Keegan Myers had two interceptions, while Jalen Hall, Andrew Ferguson, Branden Johnson and Jimmy Fashett all had fumble recoveries. RENSSELAER — John Mancini threw for two touchdowns and ran for a third to lead Fonda-Fultonville to a season-opening victory Friday night at Rensselaer High School. Mancini connected on a 43-yard touchdown pass to Massimo DiCaprio and a 6-yard pass to Jon Flander before running one in from 10 yards out. DiCaprio added a 69-yard touchdown run to his game credits, while Brady Myles led the Braves defense with a pair of interceptions. For Rensselaer, Rommel Johnson rushed for 82 yards on 20 carries. FF — Mancini 10 run (Saltsman kick). 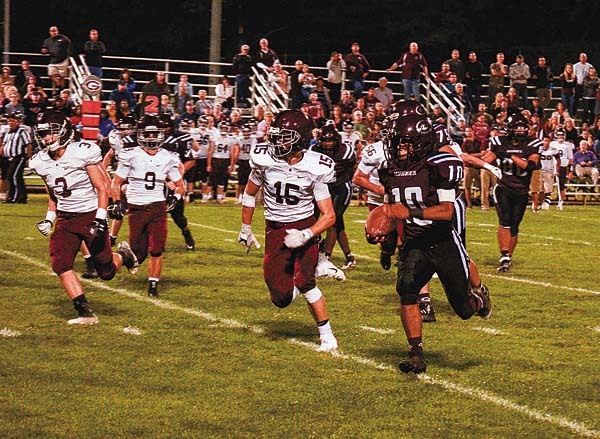 FRANKFORT — Zack Smith ran for a touchdown and threw for one but it was not enough as Frankfort-Schuyler defeated Dolgeville Friday night at Frankfort-Schuyler High School. Tyler Rosati led Frankfort Schuyler with an 8-yard touchdown run and caught a 69-yard touchdown pass from Jeffrey DeRollo to lead the Maroon Knights to victory.